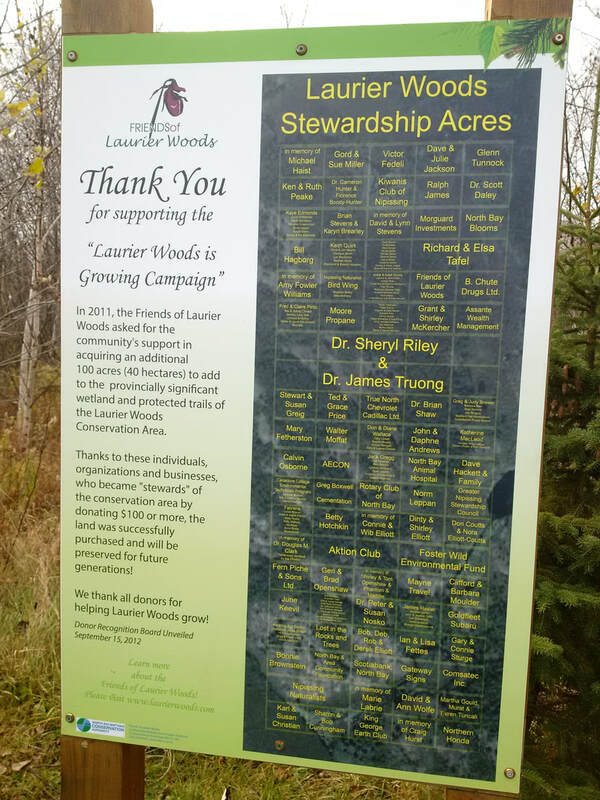 "Laurier Woods Is Growing Campaign"
The Laurier Woods is Growing Campaign was a great success, with the last 4 stewardship acres being named in 2017. The campaign was launched in 2011 to secure the community's support in acquiring an additional 40 hectares (100 acres). Donors contributed $100 or more, with donations totalling $1,000 being recognized with a 'Stewardship Acre'. The donor board is on display at the main entrance. Susan & Gordon Miller, the Commissioner for the Environment of Ontario, were presented with our first certificate of appreciation for their donation on February 4, 2011.
to add 100 acres to the Laurier Woods Wetland Conservation Area.